Hi Everybody I am new here and posted an intro. I look forward to bugging you guys! I am in Norman and we have a car club here if anyone is interested. This is one of the best Clubs I have been in. We are a club in the loosest sense of the word. We are open to any and all, cars trucks and bikes. This group meets at Midway Deli every Saturday for coffee around 9. From 8 to 11 there are all sorts of cars and trucks that show up. amazed at seeing something new every Saturday. Midway is a small residential old time Grocery/Deli. There is maybe room for 12-15 cars in the lot. We usually pack it and have 25 in the lot and others park on the street. This is a bunch of gear heads, Model A, to newer model Bentley owners. Yes there are a few VW's in the mix too. There is a group of mostly older guys that come up with things to do and Car Show of the Week to attend, but everything is strictly volunteer, you go if you want to. We held our first car show on April 21st for Food and Shelter of Norman and raised $3200.00. Over 130 cars were registered. This coincided with the 89er Days parade that day. Perfect weather and it was 100% all proceeds went to the charity. I am sure we will do it again. Come by the website, see where we are meeting, sometimes we go to a local diner for coffee instead of Midway and we will be going to Sonics in the area on Friday nights. 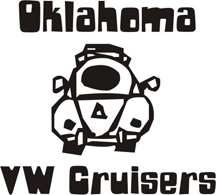 They just did a cruise to Pauls Valley Fly in and Car Show last weekend. We go to a few retirement homes and put on shows there too. We have met up with the Studebaker Club and have done some events as 2 Clubs as members are in each one. There are over 250 members on the list. Most have been added in person. So stop by and get on the list. Look for the 67 Bus too!